Playing games is a powerful way of learning a language and it’s something I’ve used to learn Chinese a lot. I’ve written several articles about this already, including how to use computer games to learn Chinese (and a separate article about StarCraft), as well as an article about word games. More recently, I have also designed a text adventure game for learning Chinese which is more specifically targeted at second language learners. In this week’s article, I’d like to bring up another kind of game I think has huge potential for language learning: board games. While I have written about Mahjong 麻將 (májiàng) before, in this article I will talk about playing board games for language learning in general, even if the games themselves are not related to Chinese. Playing board games allows you to repeat words and phrases without being bored – The language use in most board games is focused on a small cross section of vocabulary. 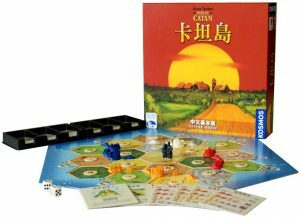 If you play Settlers of Catan in Chinese (卡坦岛), you’ll repeat 羊毛, 煤矿, 木材, 砖头 and 小麦 until these words become second nature. You will also get good at using words for trading and haggling. A game with money in it will require you to use words related to that a lot, all the time. Playing board games makes language a tool for entertainment – When playing a game in Chinese, the goal isn’t primarily to learn Chinese, it’s to have fun, win the game or both, depending what kind of player you are. This doesn’t at all feel like studying and instead you’re using the language to achieve something. I think language education in general should be more liker his! Playing board games is fun – If you enjoy board games, it goes without saying that playing the games in Chinese will also be fun. You can use your passion for games to read up on the game, understand the rules (in Chinese) and so on. Remember, having fun is important! Playing board games is social – Playing games is a good reason to meet other people (most board games do of course require more than one participant). While modern board games are not as big in the Chinese-speaking world as as they are in the West, there are still people who like board games. There are even cafés and clubs dedicated to board games (and I don’t mean only Chinese board games, I mean roughly the same games that are popular in the West). Find them! Playing board games encourages real communication – Talking about games, or explaining the rules, is something that even beginners can do (depending on what game it is, of course). I remember explaining the rules of Carcassonne 卡卡頌) to fellow students in Chinese during my first semester of learning. I used a lot of gestures ad pointing, yes, but it still worked. Explaining your favourite game successfully to a native speaker, or understanding how to play a new game someone has demonstrated in Chinese, is very satisfying! Naturally, your experience will be different depending on what game you play. The most important factor as a second language learner (apart from if you think the game is fun of course) is how important language itself is in the game. Some games involve little or no language. For example, you can play a game of chess without saying anything apart from “check” (将军). In other games, language is a crucial part of the game. The classic board game Diplomacy (外交) is a good example where the whole game is about talking with other players, forging alliances and planning how to backstab your friends. Naturally, this type of game requires advanced levels of Chinese, whereas chess can be played without knowing a single word. This is not meaningless if you like chess, there’s plenty to talk about, it’s just not a requirement to play the game. When you play a game in Chinese, you need a good source for vocabulary and sometimes grammar. This will be different from game to game, so it’s hard to compile a general list of useful words. If you have a native speaker around, that’s of course ideal, but even if you don’t, you can still play because the rulebook is a very good source of vocabulary. I suggest that you start with a game you already know how to play in your native language, then read the Chinese rules (should be possible to find online if it’s a relatively popular game, or you can buy something locally) and extract all the language you need from there. You will internalize the vocabulary, sentence patterns and so on by playing the game. I have played a number of games in Chinese and explained many more (because I’ve introduced them to Chinese-speaking exchange students in Sweden). This has been great fun and also a great way to learn and reinforce vocabulary and grammar. Have you played any board game in Chinese? How did it go? Have you introduced any of your favourite games to your Chinese-speaking friends? Give it a try! Great article! I love board games. It would also be good to include at least a few games that you recommend and what level of Chinese would you need to play them ..
Great idea. Any suggestions on good board games? My first thought would be standard board games that happen to be in Chinese like Monopoly. I played 卡卡頌 for the first time in Taiwan with the rules explained to me in Mandarin (though after the rules were explained, it’s not a game which requires much talking). It was only recently that I learned that the English name of the game is Carcassonne. The fact that I still remember it all these years later shows just how memorable the experience was. Recently played “Guess Who?” in English with my friends from China’s daughter who is learning English. It was a great game for simple and repetitive conversations and I think I might buy the game for the Chinese language classroom. Love the article, thank you! I think you can also mention some games that represent a communication challenge : such as Imagine (a kind of pictionary with transparent abstract figures), Codenames (you have to make others link different words based on a single clue), Spyfall (everyone knows where they are except the spy, all is in the questions the players ask). 三国杀 can be played freely online (mobile). Agricola (农场主) is available in Chinese. Dixit is one of the picture games which can be played in any language. Yeah, I’ve played Dixit many times with Chinese people! Definitely some differences in how people associate and think.